You will receive a very warm welcome from Josephine and Jeremy Lincoln at their family home which is a superb listed former mill house beside the river Cherwell in South Northamptonshire's lovely unspoilt countryside between Banbury and Daventry. Situated in central England,ten minutes from the M40 and twenty from the M1, it provides easy access to a wide variety of places of interest including Silverstone, Stratford-on-Avon,Warwick Castle, Stowe Landscape Gardens, Blenheim Palace, and the towns of Oxford, Banbury, Daventry and Milton Keynes. The house dates from 1685 and has a very pretty garden around which guests are welcome to stroll. The Mill House successfully blends comfort with the warm, friendly atmosphere of a family home in a very peaceful, rural setting. 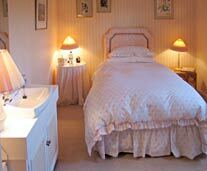 We have four bedrooms with single, double or twin beds, either en suite or with private bathroom with shower. Television, tea and coffee making facilities and Wi-Fi available. There is a swimming pool, stabling and a tennis court for use at the owners' discretion. Tennis coaching and riding lessons can be arranged if prior notice is given. 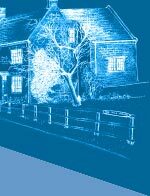 The Mill House Bed and Breakfast is 8 miles from Banbury, 8 miles from Daventry,18 miles from Northampton, 27 miles from Oxford and 24 miles from Milton Keynes. Train services are available from all four towns. West Farndon is an unspoilt hamlet about one mile south east of the local village of Byfield and it is equi-distant from the M1 (London - Northampton - Leeds) and M40 (London - Oxford - Birmingham) motorways. The Mill House is on the Jurassic Way footpath and is in an excellent walking and riding area (we have stabling for those on a riding holiday). We are 2.5 miles from Aston-le-Walls and Preston Capes equestrian centres. Dogs are welcome. There are several local pubs and restaurants which serve good food, the nearest of which is The Royal Oak in the nearby village of Eydon. 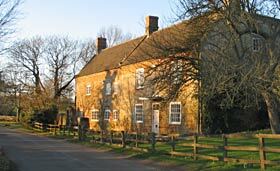 This is a 17th century ironstone inn with great character. We look forward to welcoming you to The Mill House.